SilverlightShow.net is one of those great community sites providing information, tutorials and general developer information around Silverlight. 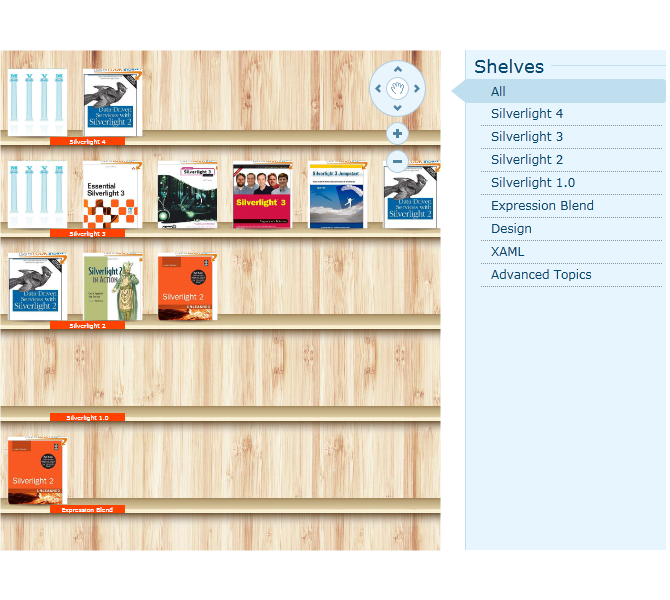 They’ve done a great job providing a spectrum of beginner to advanced topics on Silverlight development. At MIX10 I was talking with one of the brains behind the site (and Silverlight MVP), Emil Stoychev, one one of the ways they had been displaying book recommendations on their site. It was a bookshelf view that I thought was cool and I wanted to use it for my own book recommendation list on my blog. NOTE: It was funny in talking with Emil because they had this bookshelf control for a while and then the iBooks app for iPhone/iPad came out and looked really familiar. Of course, the user experience isn’t something entirely new for displaying this type of information, but it was cool to see consistency. You can see it running live and interact with it on my Silverlight Book Recommendations link here on this site. I think it is a lot better than just a standard list of links. Now I just need to fill up the shelves so they don’t look so empty! Thanks Emil and SilverlightShow! And to answer in advance, I’m not sure if they plan on releasing this as a sample control or what…that is something you’ll have to head over to their site and ask them (and check out their material as well).